I saw this adorable vintage blouse and totally in love with it! It's creme with puffy sleeves and a flower at the front. The back is layered with ruffles and wide peter-pan collar. It's stunning. 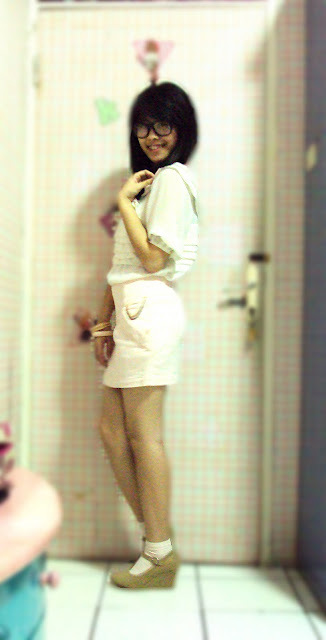 I'm also wearing one of my favorite pink denim skirt from Pull & Bear. And I just bought those adoorable wedges pumps, it's suede, and it's so pretty! I bought it only for $25! I complete it with a pair of soft pink socks.